Rock, paper, scissors. The game we all know and love. The game we all grew up with. The game that is very much an analogy for educational technology plans. Rock, paper, scissors isn’t a game. It’s a means to an end. The game isn’t the purpose, the game decides what comes next. No one plays the game to simply play the game, the game is usually played to decide an order for the bigger game; who goes first, who gets the better seat, all those important childhood decisions. The other key point to the game is here. No one element; the rock, paper or scissors, is greater than all of them. Each is better than one other but none better than all, and most importantly they all need to be part of the game. 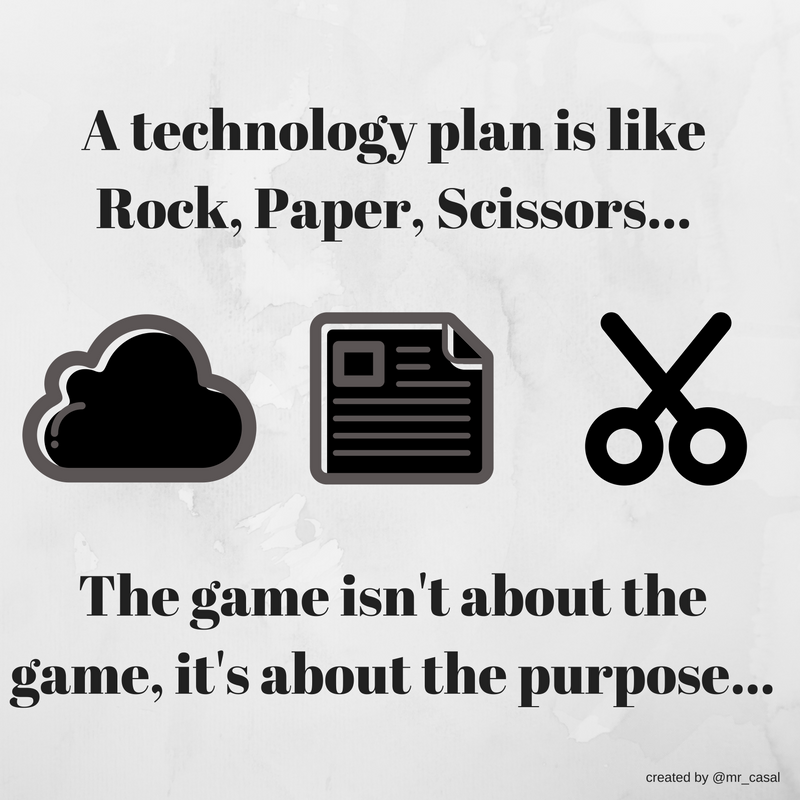 A technology plan should be like rock, paper, scissors. It should be a means to an end, not the end all be all. It should help decide something bigger. Just as rock, paper, scissors facilitates a greater activity so should the technology plan. It shouldn’t be about the plan but rather what it help get to, where it takes you. And the three elements; the rock, the paper, and the scissors? No one should be thought of as more important, no one should be kept out. And what are the three elements of a technology plan? The tech, the training, and the support. A 1:1 device plan looks great on paper, but how you do fund it? How do you implement and support it? How do you train the staff and students to get the most out of it? 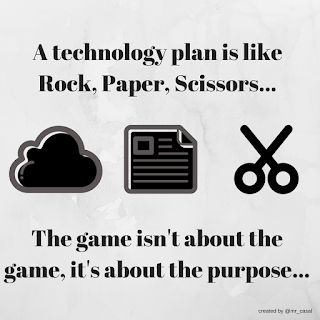 A technology plan shouldn’t be about technology. It should be about access and opportunity. It should be about the people, the students. It should be about supporting curriculum. It should be about something far greater than the tech; it should be about giving students the ability to go places they can’t otherwise, the ability to create like they can’t create without, to share beyond the walls, the ability to be engaged creators of content and curators of their digital footprint. Rock, paper, scissors facilitated the greater purpose. A technology plan should do that too. The greater purpose is open and equitable experiences that we can’t achieve without technology.